For those travelling by train we recommend getting a connecting train from Cardiff Central (Platform 6) to Cathays train station (trains heading north to Pontypridd, Treherbert, Merthyr Tydfil or Aberdare). When you arrive at Cathays, head left onto Park Place by Subway and Costa Coffee. Cross the road and take the access path left to the Sir Martin Evans Building. Alternatively you can take a taxi from the rank just outside the train station, or for those of you feeling energetic it’s about a 25 minute walk. 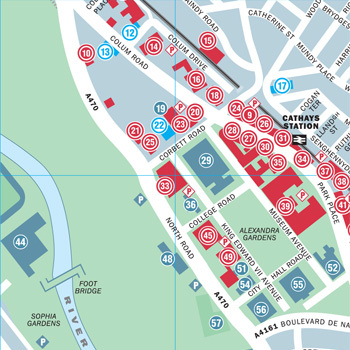 We recommend walking straight up St Mary’s Street towards Cardiff Castle, under the underpass then towards the National Museum (building 52 in map below) and up Museum Avenue. The Sir Martin Evans Building (building 35 in map below) is on the right. Travelling west on the M4 – Exit the M4 at Junction 29, follow the A48(M)/A48, signposted Cardiff East and South, to the A470. Follow the A470, signposted City Centre, into the Cathays area of the city. Travelling east on the M4 – Exit the M4 at Junction 32, follow the A470, signposted City Centre, into the Cathays area of the city. There are pay and display car parks on Museum Avenue, North Road or Colum Road. With sufficient warning we may be able to get you a visitors parking permit for the Main Building car park.